And so the final day started very strangely actually. We had been expecting a four am bugle call, which never came. 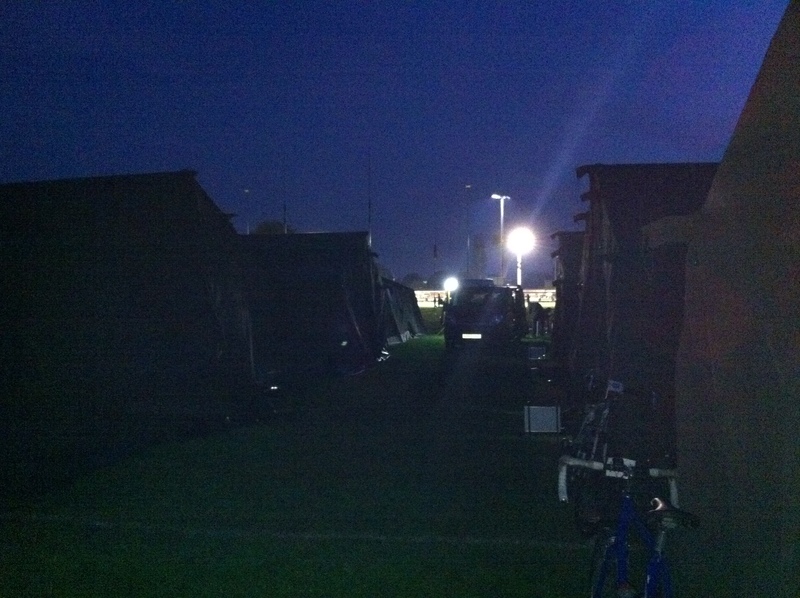 Apparently the power was out on the rugby field, and so the first person to wake up in a dark and quiet tent did so at about 5.05am. We were late! There followed a sleepy dash to get into breakfast at the clubhouse, through lights which were just coming on for us. After the usual porridge and fry up (which this morning I just couldn’t eat, I don’t know if it was nerves, or the fact that my body had eaten so much food over the last few days that it just had had enough) I dashed back to the tent to get packed and ready for the final departure. It was going to be tight this morning to get finished in time. Barry knew that not all of us would make Twickenham in time for the proposed 1pm departure, and we had 82 miles still to get there. The start would have to be a bit slower than usual also, as it was still dark. 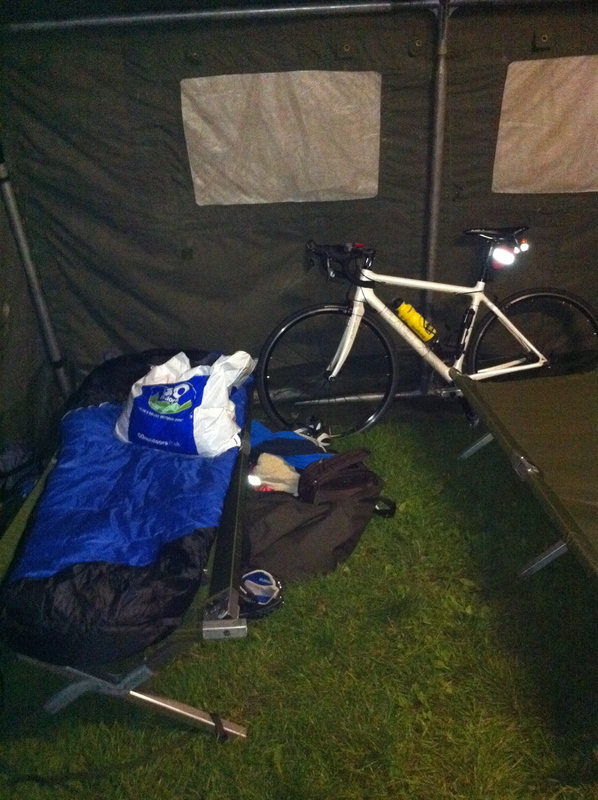 Nearly ready to pack and go, my final night in the army tent. As I was walking back to pack, some people were already setting out. Unlike the pazazz of the start for the last few days, this morning was much more muted. Freck, aka Mr England, was still in his pyjamas, still pissed apparently after giving the bar a caning with some Fijians and the locals who had played a floodlit rugby game the evening before. I got to the start about 10 minutes late at 6.10, and then decided there was no way I could cycle without going to the toilet first (too much information here already I know:)). I duly went back to the clubhouse and unfortunately I had to wait for about 20 minutes whilst they were unblocked (170 cyclists after breakfast into two male toilets = bad news). So by the time I got back to the starting line, most everyone had gone, and it was after 6.30am, and the sun was beginning to come up. This all made the start of the last day a bit of an anti-climax for me. Instead of cycling with a bunch of people and either hanging on to them, or threading my way through them, I was cycling on my own. The 82 miles that I had to go seemed like a long long way away. I began to calculate that if today was going to be at the same (13mph) average speed that I had done so far overall, then even without pit stops (impossible), I had at least 6 and a half hours to go. With refuelling stops this would mean a likely entry into Twickenham at about 2.30pm , after the scheduled ride together to the stadium itself, which was set for 1.30pm. This was awful, and so I just dug in, put my head down, and rode like I never have before. 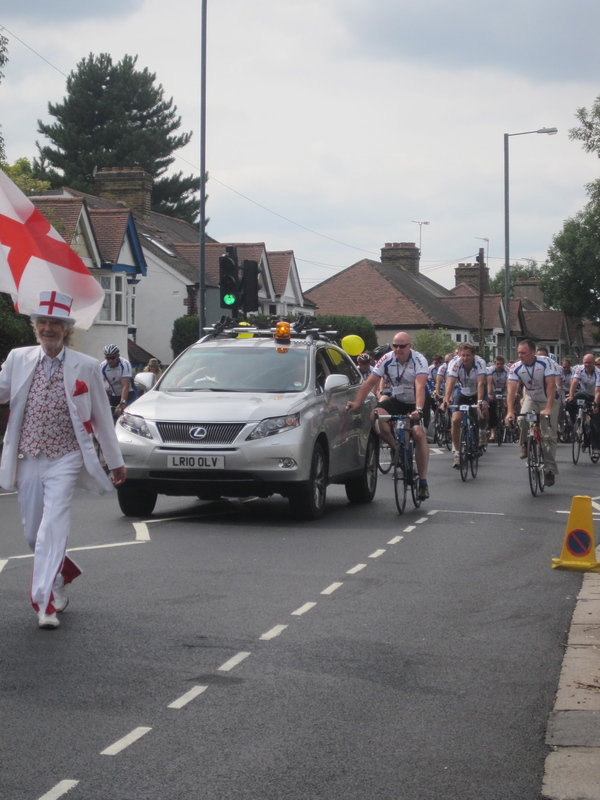 The route overall thankfully was a very kind one, taking us through New Alresford, Alton, Wheerstreet, Albury, Cobham, Esher, East Molesey, Bushy Park, Teddington before finally arriving at Twickenham. And apart from a fairly tough windy section through the Surrey Hills, which seemed a bit unnecessary quite frankly, the route was nice and easy, which helped to make up a lot of time. It was not long before I caught up and passed a lot of people. 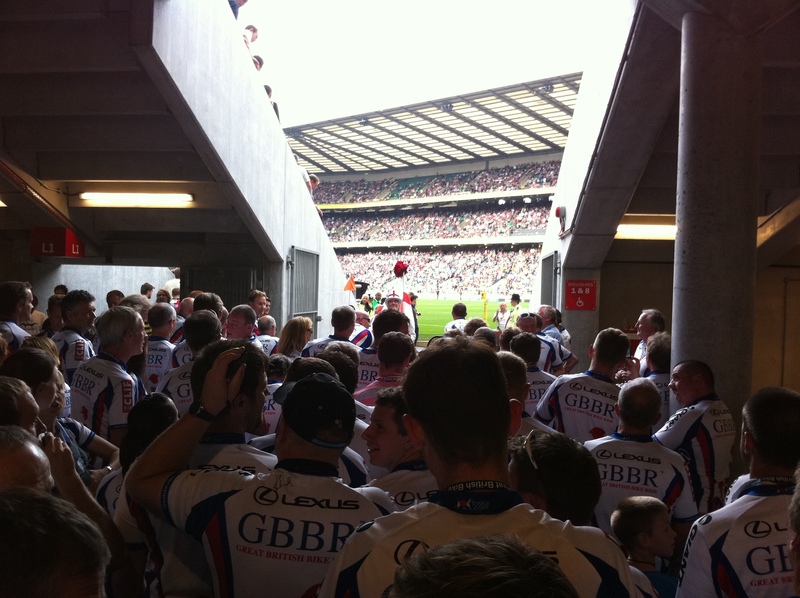 There were quite a few sets of fresh legs out there -“glory hunters” as Barry had called them in his speech the previous evening, as they would later that day get to walk into Twickenham with the rest of us who had done the whole 340 miles. This didn’t bother me at all, it was nice to have some extra people to ride with, and in some cases to get me fired up and motivated alongside. One group of about five I clung onto for about 8 miles and we went at a great pace – they stopped for a rest eventually and I just powered on – by now I was eating up time and ground. I was no longer thinking about how late I would be arriving, but just how close to the actual front of the field I could actually get. This was never a race, but believe me it got very very competitive out there for some people. I am not in their league, but it is nice to be able to aspire to their standards and be able to push yourself that bit harder because of it. I eventually reached Twickenham (or Kneller Hall, the place where we would meet and collect our bags) at 11.20. If I knock off 40 minutes or so for lunch, and the morning and afternoon pit stops, then I probably did the last leg in not much more than four hours cycling. I was amazed! When I caught up with the folks who had come in ‘first’ in the pub (bloody hell did that first pint taste good:)) shortly afterwards, they told me they had arrived at 10.50, only half an hour before me. They had set off at 6am, a full half an hour before me too. I was rather happy with that, to say the least! Shortly after I met up with Mel, who had also kindly brought down my son Dan and his girflriend Emily. All of the cyclists who had arrived then regrouped, and we cycled to the stadium together, complete with police motorcade and led by a now (probably) sober Mr England. And the next one is of me as part of the group above. I think it is the only picture of me actually cycling that I have, which considering I have done over 1,500 miles this summer, is a shame, especially as I don’t even have my helmet on (well it was only three hundred yards, not that that is an excuse). It felt fantastic to know that I, all of us, had done it. Moreover, I was safe, no injuries or mishaps along the way. It felt great. After a nice rest at the rugby stadium, during half time of the second rugby game, we were all led around the pitch itself by Richard Hill. Twelve cyclists got to ride around the track, the best thing being that Pete’s Dragons were amongst them, the most deserving people of all in my opinion. 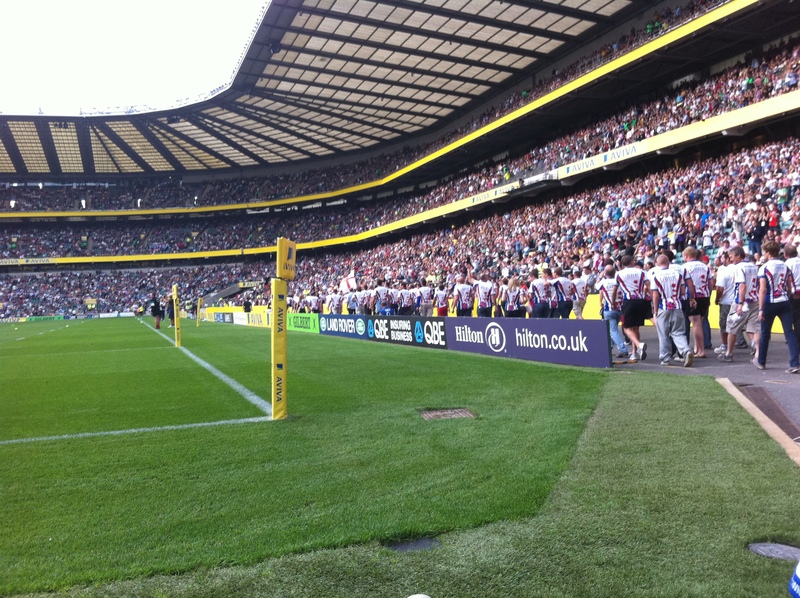 To walk around the pitch was very emotional – there were officially 75,112 people in the crowd, and they were very receptive (unlike some other half time audiences the likes of which you would see at a football game), and applauded us literally all of the way round. I had a lump in my throat the whole way. 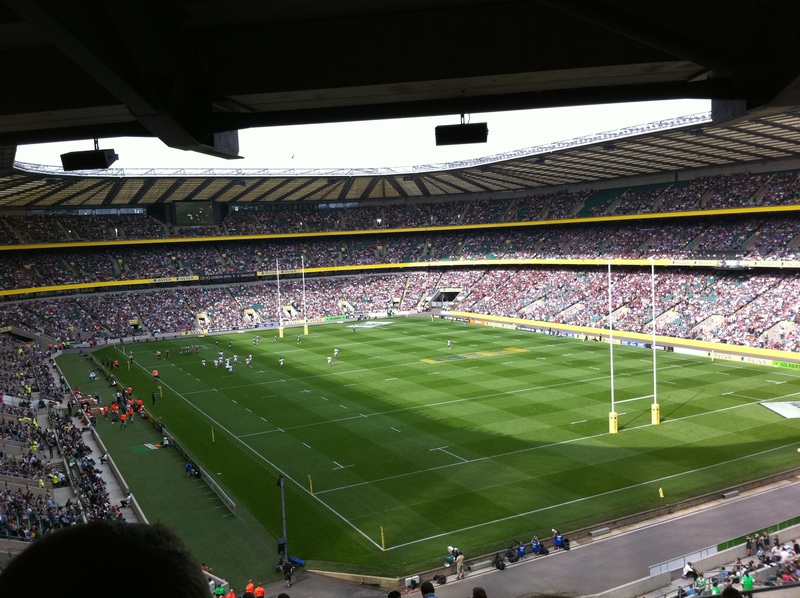 Twickenham from our seats in the South Stand. 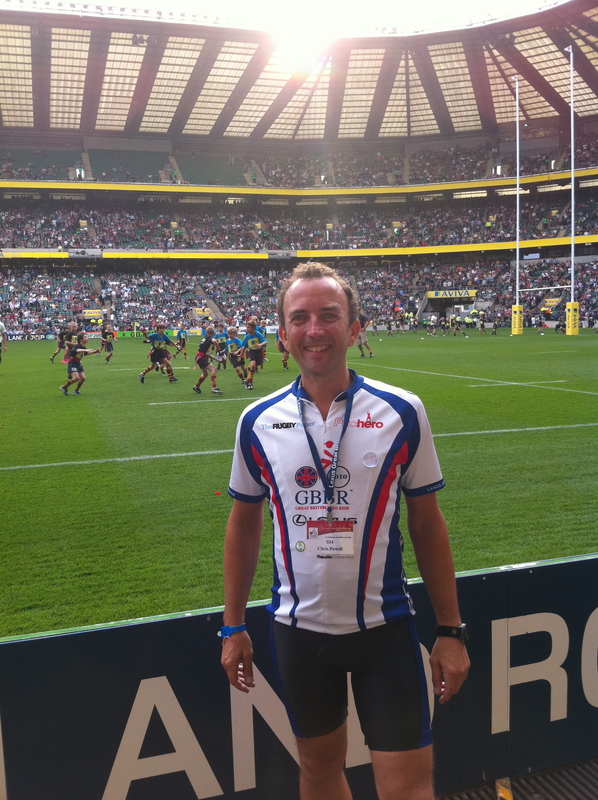 ...and me, as close to the hallowed turf as I will ever get! And so that was it. After a few goodbyes to the chaps who I had spent a fantastic and unforgettable week with, we went our separate ways. It was all over. It took me a good few days for the enormity of it all to sink in. This summer I spent I have no idea how many hours, and a good deal of money, on an event which I found utterly endearing, and absolutely brilliant. Between the people who took part, we have raised to date over £100,000 for a number of charities, including Help for Heroes. 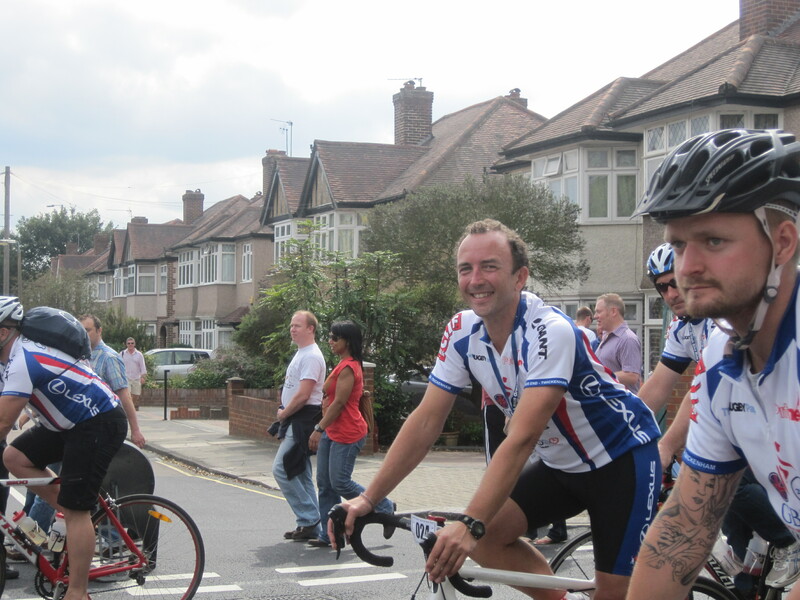 The overall statistics for the ride are 344 miles, and some 7,400 metres, or 24,400 feet of ascent. I can’t count the amount of food or calories that I ate, but I have never eaten so much in my whole life, and I am told by everyone I see that I have lost a lot of weight, I would say 10 or 12 lbs over the four days. I pushed myself harder than I have ever pushed myself. I could have given up 10 or more times along the way, and it was the toughest (apart from Stella Point on Kilimanjaro) thing I have ever done in my life. To everyone (of which more in a later post) who sponsored me, helped me, humoured me, told me they were proud of me, thank you enormously, immeasurably. To everyone at the GBBR, thank you from all of us for a fantastically well organised event – I have no idea how you pulled it all off like you did. To everyone who competed in the GBBR, well done to all of us, we were all brilliant. Ultimately, I met so many wonderful people along the way, found friends, laughed, and ultimately cried buckets when I found out the Pete’s Dragons story. I will be printing and mounting Ditsey’s poem and putting it up on my wall for all time. I couldn’t think or imagine a more fitting memento than that. This is getting ridiculous – four days is very very scary indeed. I have also had a rather poor week on the preparation front. For a start the weather has been atrocious, secondly I have had too may distractions, third I have absolutely no will power whatsoever. Take yesterday for example – I was originally going to not drink at all this week so as to cleanse the system ready for next week. But Wednesday night I got asked out for a curry, and well, one beer led to another, so that was pretty bad. I woke up slightly hanging, and then trotted off to Lords where I was being ‘entertained’ at the England Pakistan test match. 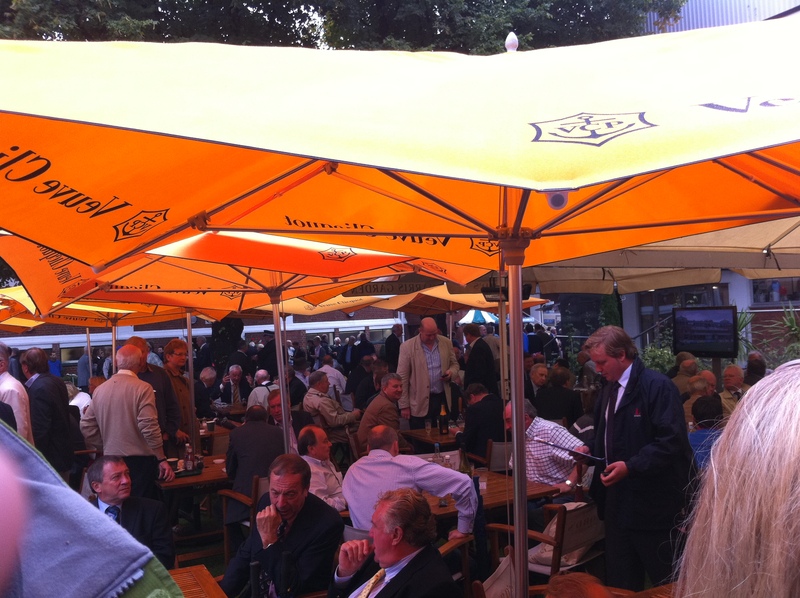 As I got there the heavens opened, and my hosts asked if I wanted to ‘go for a coffee’, which sounded like a good idea. When we got to the erm, coffee area, it looked remarkably like a Veuve Cliquot champagne area to me, and so when they asked me “coffee or champagne sir?” that was a bit like asking me if I wanted to be punched in the face or given a lifetime pass to the Oktoberfest, and so my answer was very easy. 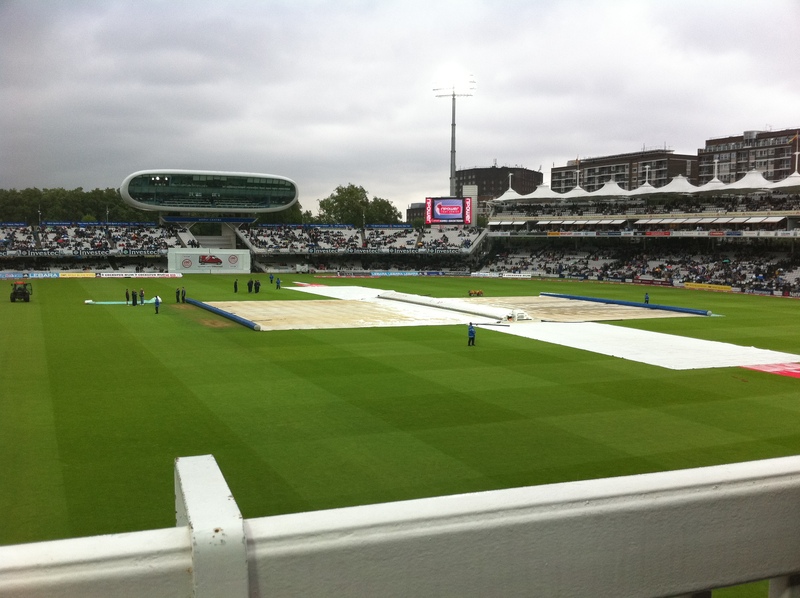 So for the other 8 or so hours that I was in the ground, we just had to take shelter in the Corporate Hospitality areas, and very nice they were too. Not very good preparation for a 340 mile bike ride really, but never mind. I did also pick up my rail tickets yesterday to get me to Lands End. I was rather surprised to find that I need eight, yes EIGHT tickets to get me on a single train journey. How ridiculous is that? It just annoys me as it is such a waste of trees – you would think they could do these things electronically these days. I have a new cassette! Now one of the things that I have been worried about most in terms of the ride are the hills. Distance is one thing (and apparently the ride has gone up now to 344 miles I think), but hills are quite another. Give me 50 miles of nice flat terrain (preferably with a following wind:)) and I am pretty happy, but give me a nasty hill and I am off the bike and walking. They hurt everything for me, just don’t like them. “……When choosing a bike we recommend that you chose the correct gear ratios. You will need three/triple chain rings on the front and most bikes nowadays have 8/9/10 gears on the back. Due to the length and steepness of some of the climbs we suggest that you have an easy gear so that you can keep spinning your legs. So did I get a bike with a triple chainring on the front? Nope. Did I get a bike with a 27 tooth gear on the back? Nope! I have of course known this for a long time, but as I have had the luxury of cycling round Oxfordshire all the time, it hasn’t mattered much as of yet. Oxfordshire you see bears as much resemblance to Cornwall as Norfolk does to the Himalayas. They are very very different creatures. And yet still there are hills around Oxfordshire where I have to get off and walk. Doesn’t bode well does it? Not that there is any shame in walking (in fact I have no shame at all, as others may testify), but I do want to try to finish the ride after all. So anyway, since I am now tapering, I thought I would get myself a new cassette fitted. I duly went to Beeline Cycles on the Cowley Road in Oxford (url below, highly recommended shop by the way) and asked them if they could fit me a new cassette. I was offered an array of different types, and in the end plumped for an 11-28, which I am hoping does the job. They advised me that I would be wise to have a new chain fitted with the new cassette to make sure that they match, and so I did just that. They also serviced my bike for me at the same time, checking all joints, cables, brakes etc etc., and finally gave it a nice clean for me. So I am good to go for those hills, now I have no excuse! OK, so here I am with less than seven days to go. Bloody hell! Tomorrow I am going to put down here some cycling “Do’s and Don’ts”, as I have learned so much in these last fifteen weeks. Until then…..